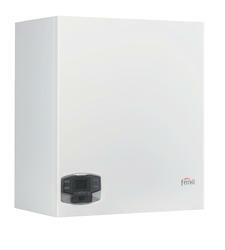 Wall mounted modulating condensing boiler for heating with premix burner with very low emissions. Modular, premix, condensing heat generators, with very high efficiency and very low polluting emission, operating on natural gas or LPG. These generators have been designed to be installed in modular configurations, (up to five) to extend the benefits of high-efficiency heating to larger applications.